Even though, we are living in Southern Maryland, close to DC, Baltimore weddings are always special to us. As native Marylanders, we love capturing weddings in the places we grew up. Jane was born in Baltimore and raised just outside the city. Some of her happiest memories were inside the city, visiting aunts and cousins in their cozy rowhomes as plates of homecooked foods were passed around. She treasures the polaroids from the holidays spent with her great-grandmother. She never imagined one day, she'd be back in the city she loves so much capturing the memories of other families. The beautiful and mysterious buildings she'd watch pass by from the backseat of her grandparents' car window are now the places she photographs couples with their friends and family. As she drives into the city on these wedding days, she recalls summer evenings at Camden Yards, long afternoons spent walking along the harbor, or exploring the National Aquarium. Festivals in Fells Point filled her weekends when her Mom-Mom and Pop would come to town. Her great uncle still lives in the rowhouse her great grandfather and great grandmother bought in the early 1900s after arriving from Hungary. The Belvedere holds lots of rich Baltimore history, just like the rowhouses that Jane visited as a child. Built in 1902-1903, it's been in Baltimore just as long as Jane's family. Once a hotel where all of Baltimore society gathered, it was converted into a mostly condominiums in 1991. The ballrooms were restored and are now available to couples that are looking for that elegant Baltimore charm. The Belvedere and Co. events manage the venue and have lots of experience helping couples plan their dream wedding. Onsite catering by Express Catering offers Baltimore favorites, such as crab cakes. Fill the bar with some National Bohemian aka Natty Boh for a true Charm City feel. The former hotel has 3 ballrooms, a wood paneled library, and the 13th Floor for you to choose for your event. Each space has it's own look and feel, so you can pick one for the wedding you've always imagined. Smaller ballrooms are exactly what you need for your intimate wedding. Once the wedding and reception are over, you don't have to let the party end. You and your guests can head over to the Owl Bar, one of Baltimore's oldest speakeasies is just off the main foyer of the building. Beers, wine, and cocktails along with lite fare, and a full lunch and dinner menu are available. When they are ready to head to bed, the Hotel Monaco is a short uber ride away. The modern hotel is in the former B&O Railroad headquarters. The building was built in 1906, not long after the Belvedere's opulent rooms were open to the highest of Baltimore's society. The beds are a lot more comfortable but the staff is just as attentive. The next morning, they can nurse their hangovers at Miss Shirley's or Blue Moon Cafe, two of the cities most popular breakfast spots. Finish out the weekend with a walk around the harbor or a visit to the Aquarium and enjoy the city that Jane loves so much. Planning a Baltimore wedding, contact us! 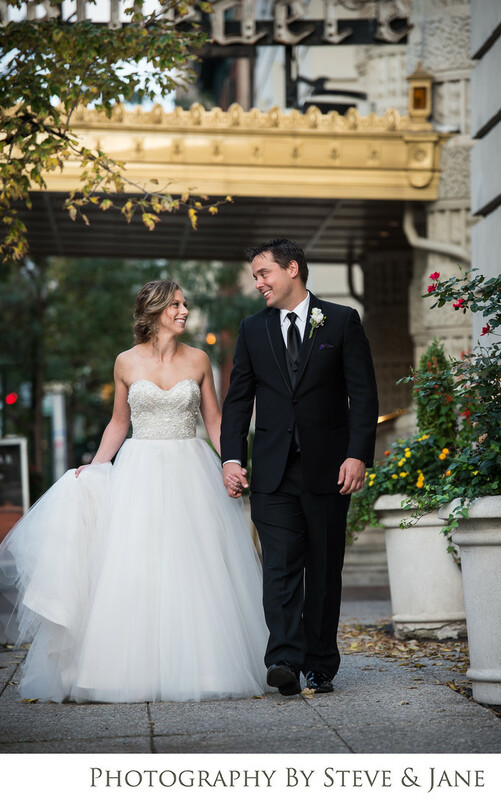 We'd love to capture your day in the city that means so much to us! Location: 1 E Chase St, Baltimore, MD 21202.